Whiplash is an injury to the neck which often happens to people in automobile accidents. Among those victims of whiplash, 60% never fully recover. This could be because of unrecognized damage to your jaw joints and the muscles which support those joints. Whiplash is the common term for a neck injury which often occurs when riding in a car which is hit from behind. Typically, the passenger’s head forcibly snaps backward as the body is thrown forward. The head may then snap forward to recoil motion. This severe backward and forward motion damages the neck muscles and especially the soft tissues (muscles and ligaments) supporting the neck, head and jaw. It is easy to see why this damage happens, when you consider that the head itself weighs up to 15 pounds (the weight of an average bowling ball). When this “bowling ball” snaps backward, it creates 500 to 600 lbs. of force on the neck! Women are even more vulnerable to whiplash injuries than men because their neck muscles are smaller in relation to head weight. Since injuries to soft tissues don’t show up on x-rays, it is difficult to immediately see whether or not these structures have been damaged. The symptoms may not be felt until hours, days or months after the accident. Once symptoms do appear, however, they can be very painful and quite persistent. Because both patients and health care providers often do not suspect that the jaw joints and muscles may have been damaged, this aspect often goes unrecognized. When not recognized and treated it can become the dominant medical problem. How can the jaw be affected by a neck injury? To understand this, it is necessary to have some knowledge of how the head, neck and jaw are related. In everyday life, carrying the head upright is no small task! The head is completely supported by the neck –which also serves as the heads lifeline to the rest of the body. The uppermost part of the spine provides the skeletal support for the neck. These seven small bones or vertebrae, are called the cervical spine. Attached to and between the vertebrae are pads of cartilage called discs, which acts as cushions or shock absorbers as the spinal bones move. The skull sits on top of the atlas-the uppermost bone of the cervical spine. The atlas is appropriately named after the Greek god who supported the weight of the world on his shoulders. The mandible, or jaw, is the moveable part of the head that involves speaking, chewing and swallowing. It is attached to the skull by two joints on either side of your head, just in front of your ears. 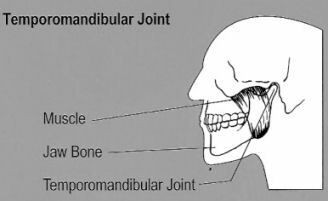 These joints are called the Temporomandibular Joints (TMJ for short). These joints also have a small disc of cartilage which sits on top of each joint like a cap to allow for smooth movement of the jaw. Jaw movement is controlled by a complex balance of many muscles. Some of these muscles attach the jaw to the skull. These allow you to close your teeth together. Others attach the jaw to the front of the neck below which allow you to open your mouth very wide. Keeping the head properly balanced on top of the spine involves many muscles of the jaw, neck, shoulders and back. When the neck is forced to move beyond its normal range of motion, as with a whiplash, the muscles and ligaments stretch and tear. The discs which cushion and protect the neck vertebrae may also be damaged. The muscles which control your jaw are also affected. Those which attach the jaw to the front of the neck do not have time to relax. 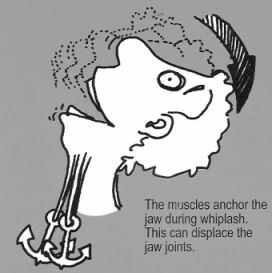 They end up anchoring the jaw by holding it still so that the mouth opens too wide while the head snaps back. This excessive opening of the mouth while the head snaps backward may cause the jaw joints to dislocate. Jaw joints are often rammed up against the back of the delicate part of the skull bone which encases these joints. As with the spinal column, this may compress and damage the disc which typically cushions each jaw joint from these delicate areas. It is estimated that 38% of all impulses that go to your brain pass by the TMJ area. Consequently, when these joints are displaced, they impinge on sensitive nerve endings and cause a variety of symptoms. Many of these symptoms are quite similar to those which are typically associated with a whiplash. If you, a friend or a relative are suffering from the persistent symptoms of whiplash and suspect that your jaw joints and surrounding muscles might have been damaged contact Dr Barron’s office. Dr Barron will conduct a thorough evaluation of this joint area. If the jaw muscles or joints were damaged, treatment will involve fitting an orthotic device, between your upper and lower teeth. This will limit the movement of the injured joints and properly support the jaw so that pain is reduced and healing can occur. It will also prevent further damage to the TMJ area.